This list of recordings with brief annotations was prepared by Tom Godell, president of the Koussevitzky Recordings Society. It is recommended that the first time Koussevitzky buyer start with the RCA recording of Prokofieff's Classical and Fifth Symphonies, and then continue with the Sibelius set on Pearl. Comments and/or additions to this list are invited. Send them to Tom Godell. The orchestra is the Boston Symphony, unless otherwise indicated. Not all releases are currently "in print", though many are available used through the linked sources. DEBUSSY: La Mer; with DEBUSSY-RAVEL: Danse; RAVEL: Daphnis and Chloé Suite 2; Mother Goose; SATIE: Gymnopedie #1; FAURE: Élégie. Jean Bedetti, cello. 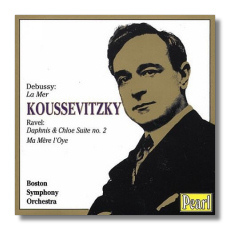 Koussevitzky's colorful, dynamic, and thrilling La Mer is the only one comparable to Pierre Monteux's classic account from the mid-50s. Transfer engineer Mark Obert-Thorn has obtained an amazing dynamic range and presence from the original 78s. Mother Goose is lovingly characterized, and the Fauré has never sounded more lovely. However, Koussevitzky's later recording of Daphnis (on RCA, below) is preferable. HARRIS: Symphonies 1 & 3; with FOOTE: Suite for Strings; McDONALD: San Juan Capistrano; COPLAND: El Salón México. Recorded in performance at Carnegie Hall, Koussevitzky's Harris First is an incredibly powerful statement. The sweep and grandeur of this reading has never been matched. The Foote suite gets an exuberant performance, and the Boston Symphony strings are given a marvelous opportunity to show off their virtuosity and beautiful tone. Rosario Mazzeo's hilarious clarinet solo in El Salon must be heard to be believed. 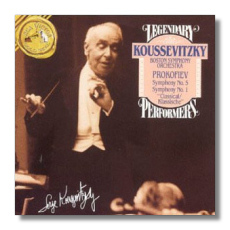 Koussevitzky's lively and strongly accented performance of the Copland sparkles from start to finish. SIBELIUS: Symphonies 2, 5 & 7*; The Maiden with the Roses from Swanwhite; Tapiola; Pohjola's Daughter. (*BBC Symphony) 2 CDs. 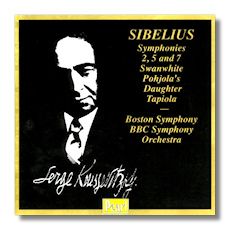 Koussevitzky had a unique sensitivity to the dark moods and colors of Sibelius's music. The blazing intensity of Koussevitzky's BBC Symphony concert performance of Symphony 7 is only one of the great treasures here. MOUSSORGSKY-RAVEL: Pictures at an Exhibition; with RAVEL: Boléro; Daphnis and Chloé Suite 2; La Valse; DEBUSSY-RAVEL: Sarabande. 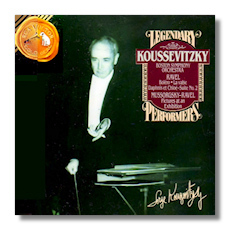 Koussevitzky commissioned the Ravel orchestration of Pictures at an Exhibition, and he leads a kaleidoscopic and deftly-paced performance. His second recording of the Daphnis Suite is brilliantly colored and builds to a stunning climax. Ravel didn't always appreciate Koussevitzky's very personal interpretations of his music (especially Boléro or La Valse), but after one concert he was heard to say: "Well, maybe it wasn't exactly what I intended, but it was good. It was very good!" PROKOFIEFF: Symphonies 1 & 5; Danse finale from The Buffoon; Roméo & Juliet Suite 2 (excerpts). 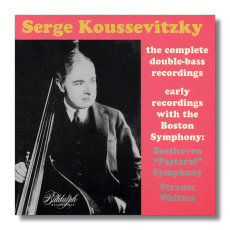 This disc is a perfect introduction to Koussevitzky and his unique style. No subsequent conductor has yet approached the epic grandeur or tragic depth of Koussevitzky's interpretation of the 5th Symphony. Tempos are bracing and the tension, especially in the slow third movement, is almost unbearable. The R&J excerpts are absolutely shattering in their intensity and emotional power. The sound has a depth, presence, and clarity that rivals many modern releases. 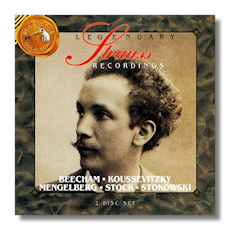 STRAUSS: Also sprach Zarathustra (with other Strauss works performed by Beecham, Mengelberg, Stock, and Stokowski). 2 CDs. A profound and deeply moving account of this enigmatic score coupled with classic Strauss recordings by four other great conductors of the 78 era. The deliberate tempo of the opening sunrise section should surprise those who are familiar with this music only through its appearance in "2001: A Space Odyssey". BEETHOVEN: Symphony #6; with J. STRAUSS: Vienna Blood & Voices of Spring Waltzes; with the complete double bass recordings. 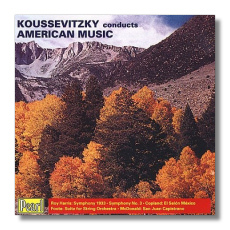 Koussevitzky's virile, no-nonsense approach to Beethoven's often over-sentimentalized Pastoral Symphony is the only one that bears comparison with either Hermann Scherchen's or Paul Paray's, though the Russian is more gentle and less driven than either of them. His double bass playing boasts a tonal beauty and vocal quality that is unsurpassed. The recordings were made in the late 1920s, but the sound is clear and relatively clean for its time. 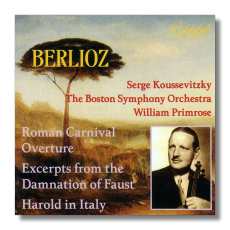 BERLIOZ: Harold in Italy; Roman Carnival Overture; Damnation of Faust (3 orchestral excerpts). William Primrose, viola. The most stirring Harold ever. If like me you think this piece is pure trash, you'll be amazed at how Koussevitzky manages to make it seem, for the moment at least, like a masterpiece. The remaining music is of a much higher quality, but the performances are just as thrilling, especially the blazing climax of the overture. The 78s used for these transfers are rather noisy, if you're bothered by that sort of thing.